Discovery Suites (Ortigas Center, Pasig City) is now the official residence of the Miss Earth 2010 winners! We are truly happy to work with them as they welcome Nicole Faria (Miss India), Watsoporn Wattanakoon (Miss Thailand) and Victoria Schukina (Miss Russia) to the Philippines. Know more about Discovery Suites and their accommodations and facilities on the link below. FINALLY AFTER 48 YEARS!! !THEY ARE COMING TO MANILA!!!...PFFFFFFTTTT!!!!! Maybe they all refused? Since the titleholder has to do some work until the next winners are crowned. omg...i want to see nicole faria! it is near my workplace. i love nicole faria! Hobbies/Interests: Dolls, Freeweights, Fashion, etc. Shameful. That is all I can say. In my opinion, this really undermines the credibility of Miss Earth. Clearly, Miss Russia, without rhyme or reason assumes a title she did not even come close to qualifying for in the pageant. If Jennifer Pazmino really did resign, then Miss Thailand and PR should have been "upgraded" as is the normal protocol for any dethroned/resigned winners. And further, I simply can NOT believe that one of the other finalists at ME would not accept this opportunity to wear a ME crown. 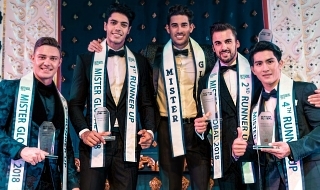 The Miss Venezuela contestants in particular are highly professional, and spend their entire lives preparing for this sort of opportunity, so I am sure that the "non availability" of the other finalists was not the real issue. ME itself has a precedent from 2002 when Dzela Glavovic was defrocked. This is obviously a pathetically transparent attempt to woo Krassa Rossi to sponsor ME in the future. A very poor move by Carousel, just when it really seemed to be getting its act together. I am sure this wil NOT sit well with national directors or fans. Jon A wrote: Shameful. That is all I can say. that's actually what i thought too, that maybe they wanted to build better relationship with the russian organizers.. but then again... do the elemental queens really matter? the miss earth org is kinda inconsistent for me.. although i really still do enjoy the pageant, i definitely have it second after miss universe.. it annoys me how like in 2005 and 2006, the miss earth's were so active going to lots of countries, then after that fans are expecting the next queens to be as active, but instead they became like miss international. I'm happy this year Nicole is already more active than 2007-2009 queens though. I'm a ME fan, BUT I kinda disagree on this one. What's the basis of crowning MISS RUSSIA as the new MISS AIR ???? 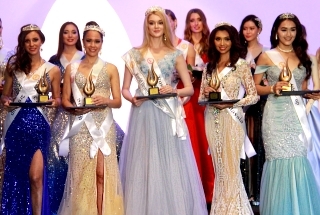 The organizers should've chosen one of the top 8 finalists to get the crown (Miss Japan, Miss Venezuela, Miss S.A.). I'm just wondering why they chose Miss Russia over those misses to be the new Miss Air ???? What...? Don't get me wrong... I'm a fun of Miss Earht, and she's gorgeous... but how come she got the crown and the title...??? I mean... how about the other three girls who made the final cut??? This is totally senseless. Did Russia take over because Ecuador got married? Anyway,ridiculous move.. As Jon said,Miss Water (Thailand) should've replaced her.. Credibility ZERO. well miss world has done it year in and year out? the crown and semifinals spot because of sponsorships? SantifromItaly wrote: This is totally senseless. Did Russia take over because Ecuador got married? Anyway,ridiculous move.. As Jon said,Miss Water (Thailand) should've replaced her.. Credibility ZERO. What a stupid statement? What does MW have to do with this? And you can scream all you want, Lina, but ME is nowhere close to MW, in its reach, credibility or prestige. In fact, the most controversial winner in recent times has been ME 2008, Karla Henry. Last edited by lina morales on Sat Jul 16, 2011 3:21 am, edited 1 time in total. I couldn't agree more.......... MW might be the oldest among the four, BUT yet the most boring amongst them as well !!!!!!!!!!!!!!!!! i'm sure there's a logical explanation why Miss russia was quickly elevated to miss Air. Maybe Carousel Prod. did offer the title to the remaining top 7. and maybe the Miss South Africa, venezuela and Japan declined the offer - maybe they already have plans after they reign . I think miss south africa is goingto compete in another pageant. And I remember Miss Venezuela has an existing contract with a modelling agency so maybe she declined the offer. Maybe miss japan has another offer. who know? i'm sure Carousel prod. could explain all this. since the top 7 declined the offer. maybe miss russia place 8th overall - so she is next for the title. Personally, for me, Miss Earth DID NOT lose its credebility. Maybe if the winner was dethroned like in 2002 and they replaced her with just the top 16 - maybe i might question that. But they only replaced a runner up - miss air. so for me its okay. 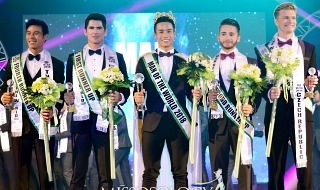 since miss air, water and fire are of equal position and anyone of them can replace miss earth, theres no need to place miss thailand or puerto rico as miss air. BUT WHY HER? NO ONE IS ANSWERING THE QUESTION! I MEAN EVERYONE KNOWS THAT MISS AIR IS EQUAL TO 1ST RU POST BECAUSE IN 2002 MISS AIR REPLACED MISS EARTH! IF ALL THE THREE ARE REALLY EQUAL THEN MISS EARTH 2002 SHOULD BE REPLACED BY ALL THREE RUNNERS UP! THAT YEAR THEY SHOULD HAVE 3 WINNERS!